Following a successful Foundry658 Bootcamp, where 33 teams progressed their business ideas, 10 teams have been chosen to proceed to Accelerator stage. Each team demonstrated ambition to grow their idea into a scalable business from applying the lean methodology of start-up business taught in Bootcamp. The Accelerator is the heart of Foundry658 and continues the process begun at Bootcamp. Over the next 12 weeks, the Accelerator teams will receive $20,000 in seed funding and work full-time on transforming their creative ideas to market-ready businesses. Teams will be supported by weekly classes and business coaching, mentorship and talks from industry experts. The Foundry658 Accelerator will culminate in a public Demo Day event for potential investors, partners and creative community peers. Hear about Demo Day and application news by signing up to Foundry658 newsletter today. The Bootcamp program consists of a series of workshops and coaching, for teams and individuals, to test your concept and learn more about what it takes to start or grow your creative business. Working amongst a group of your peers, sessions are designed to test and support the development of your chosen project. Applications are currently closed. To find out when the next round of Foundry658 Bootcamp programs open, sign up to our newsletter. Meet the 33 Foundry658 Bootcamp Teams who took part in a rigorous three-week business development program with our experts. Six of the Foundry658 Accelerator teams are featured in this image. 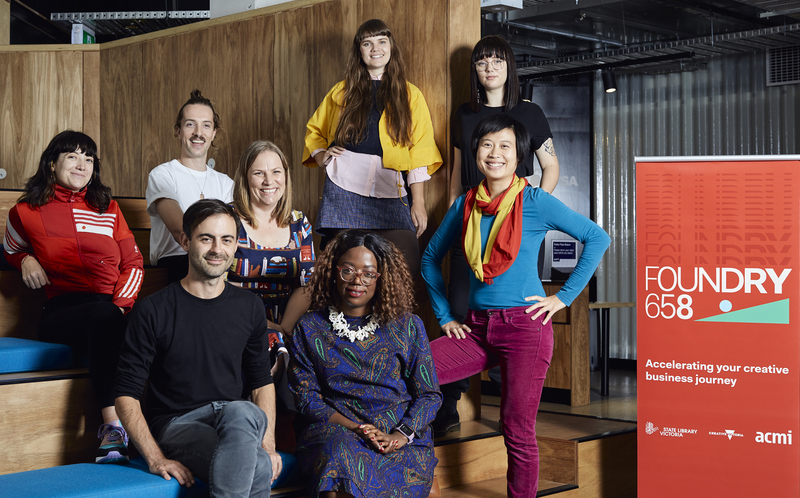 An initiative of the Victorian Government’s Creative State strategy, delivered by State Library Victoria and the Australian Centre for the Moving Image (ACMI). Foundry658 supports creative people to transform their ideas into sustainable businesses.